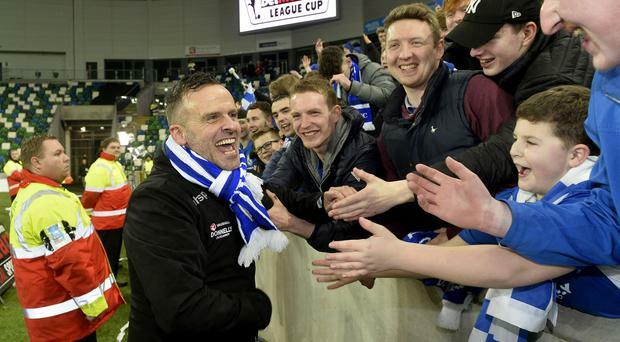 Rodney McAree leads celebrations with Dungannon supporters after the club's League Cup success. The celebratiuons begin for Rodney McAree and his staff in the Dungannon dugout. Rodney McAree leads the celebrations. We did it! League Cup success sinks in for Rodney McAree. Ahead of Saturday's BetMcLean Cup final between Dungannon Swifts and Ballymena United, the popular prediction was a cup defence by the Sky Blues. But that was a pre-match opinion not shared in the manager's office at Stangmore Park - even if Rodney McAree's own view didn't leave those four walls. At a refreshingly jovial post-match press conference, McAree revealed that he had been quietly confident ahead of kick-off and felt that his side's flowing style would be well suited to the Windsor Park surroundings. "Did I feel it was going to be our time? Yes," he smiled. "I thought the pitch was always going to suit us - the size of the pitch and the areas we were going to go and play. I had a real good feeling but I thought we had a really good chance going into tonight's match. "We did try to play, we can play better but there were a few nerves. Ballymena played in six finals in seven years and we played against the greatest ever Irish League manager in David Jeffrey and his right hand man Bryan McLoughlin and we had to get the better of them. "I knew we would have to score at least two goals because of their attacking threat. We weathered a storm, soaked up pressure and I thought the size of the pitch would suit us. I had a good feeling going into it."" McAree, of course, is the son of former Swifts boss Joe. Few families have put more into Dungannon Swifts than their own. A proud Rodney reflected: "I'm ambitious and hopefully this kicks the club on more and we can progress further. It's a very proud moment for myself and my family. "The years of hard work that my mother and father put in at this club - this is a little bit of a reward. I'm so proud of the players, staff, committee and chairman - everyone who has helped us. "We have a tendency to get a great bunch of boys in and around us but this is as tight-knit a bunch as I have seen at Dungannon Swifts and they will enjoy this moment."